Cooking up Trouble on sale! Who doesn’t love a couple of gorgeous Australians who can cook? 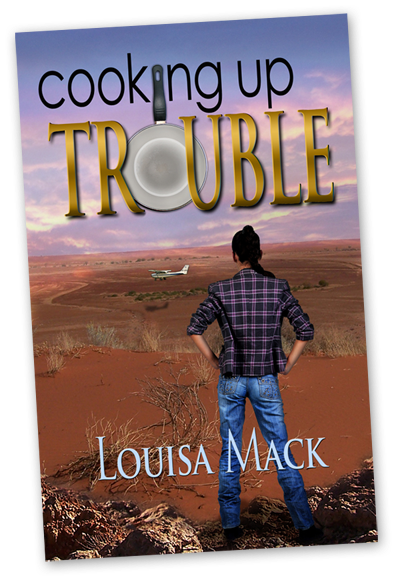 Well, grab your fan and get ready to laugh because the wonderful Louisa Mack’s latest romantic comedy, Cooking Up Trouble is out from Smashwords! Buy your copy here. Update! It’s now available on Amazon for $0.99 here. Take a woman who cooks like a goddess. Add a lawyer whose voice sends tingles up her spine. Stir them together with a pub in the middle of the Australian outback to make an interesting mix. Sprinkle in a villain who will stop at nothing to hit the big time and someone putting dope in the dinner. Season it all with a visit from Mother and a handful of elusive opals and you’re Cooking Up Trouble.